Just how vital onions are to our cooking should never be underestimated. They have formed the basic ingredient to countless dishes for more than 5,000 years and the culinary world would be a far duller place without the flavours they offer. To obtain the best results: Onion, shallot and garlic bulbs are fairly easy to grow, and, you can produce good yields from year to year if you follow a good rotation system. Allow a gap of two to three years before you grow any other member of the onion family on the same piece of ground. Rotation lessens the likelihood of build-up in the soil of pests and diseases that affect onions, which means that the plants will be healthy and your harvest from them will be successful. Prepare soil well in advance: If you add manure to soil that will be used for cultivating onions too close to planting time, the bulbs are likely to rot off in the ground. And if they do grow, they probably won't be good for keeping. Avoid planting in soil that is high in nitrogen, which promotes leaf growth at the expense of the bulb. Successful planting: Onions, shallots and garlic are all planted in the same way. Hold the bulb between your thumb and first two fingers and push it into soil that has been well broken down, so that the point is uppermost and slightly lower than soil level. This will protect the bulbs from birds that might pull them out of the ground. Sometimes the bulbs are pushed out of the soil by the developing roots a few days after planting. 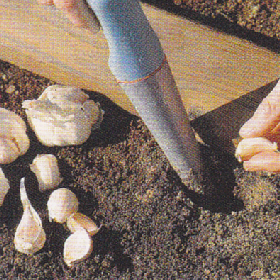 Prevent this by planting each bulb in a narrow but fairly deep hole made with your finger or a dibber. If bulbs are pushed out of place, they will need to be repositioned, otherwise the roots will grow sideways rather than downwards. If you buy onion, shallot and garlic sets for planting from a garden centre, choose plump, healthy sets. Choose onions to suit your requirements. Spring onions are sown in summer to be harvested and used fresh up to the following spring. They are left in the ground and picked as needed for use in salads. Globe onions are harvested in late summer and stored in a dry place to keep through winter. To grow small white onions for pickling, sow 'Pompei' and 'Paris Silverskin' densely from February to May. They will be ready to harvest and pickle in summer.